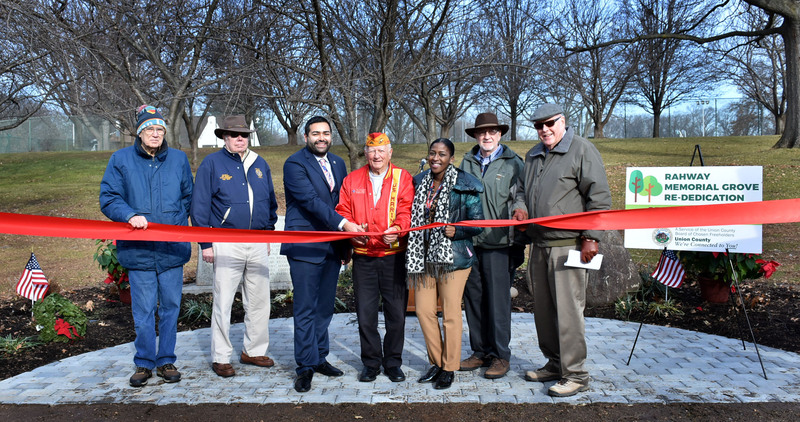 Union County, NJ – Union County, NJ – The Union County Board of Chosen Freeholders is pleased to announce the restoration of the Rahway Memorial Grove, a World War II memorial located in Union County’s Rahway River Park in Rahway. A ribbon cutting ceremony to mark the restoration was held on Thursday morning, December 20. “With this restoration project, we honor the words engraved on the memorial: ‘May their sacrifice not be in vain,’” said Freeholder Chairman Sergio Granados. “World War II created an enormous impact on Rahway and communities like it throughout our nation. I hope that the restoration will provide visitors to our park with a new appreciation for the sacrifices made by our military and their families in the past, present and future. The memorial was established in 1947 by the families of 58 Rahway residents who lost their lives in World War II. They planted total of 58 oak trees in various places in the park, and placed a stone memorial holding a plaque that lists the names of each of the 58 who gave their lives. The restoration was coordinated by the Office of Veteran Services, which was established as one of Chairman Granados’s initiatives for 2018 to expand Union County’s engagement with veterans, active duty military, and military families. A total of 34 mature oak trees remain from the original 58 plantings. As part of the restoration project, this year 24 new trees were planted to replace the missing ones. The stone memorial was also moved to a new location in the park where it is more visible to passers-by. The new location, which also holds the David Fisher World War II memorial marker, includes landscaped features to draw the eye and a paved area to improve accessibility. Benches will also be added to provide for restful contemplation at the site. The location of each of the original 58 trees is indicated on a historical map dated 1947. The map also assigns an individual tree to each name on the memorial plaque. An updated version of the map will be available online as part of the restoration project. Local Boy Scout Brian Esteves has also contributed to the effort. He is installing tree markers, so that visitors can easily identify trees that belong to the memorial grove. Each marker is engraved with the corresponding name listed on the original map. The Rahway Memorial Grove and David Fisher memorial markers are located just east of the swimming pool complex, off Rahway Park Drive in Rahway River Park. For more information about the Union County Office of Veteran Services contact Janna Williams, Office Coordinator, at jwilliams@ucnj or 908-527-4918 or visit online at ucnj.org/uc-hero.